Somebody has decided to rent Donald Trump’s childhood home. 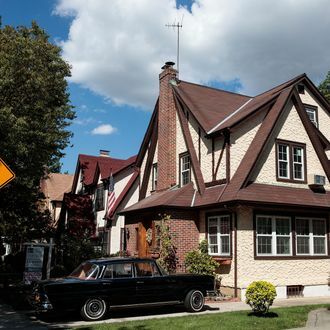 The property in Jamaica Estates, Queens, which sold for $2.14 million at auction in January, reportedly went on the rental market on Thursday. Less than a day later, 85-15 Wareham Place has a tenant. The identity of the person who wants to sleep in the five-bedroom Tudor the president lived in until he was about 4 years old has not been revealed, but the broker told DNAinfo that the future occupant signed a long-term (at least a year) lease and the property rented for more than the asking price of $3,500 per month. Trump’s home went up for sale last year, and languished on the market until its owners decided to put it up for auction in October — which they later postponed, figuring they’d get more money if Trump pulled out a win. A Manhattan real-estate investor scooped up the property in December for $1.39 million, which he flipped for a profit at auction ahead of the inauguration. The identity of the mysterious purchaser of Trump’s home is hidden behind Trump Birth Home LLC, though it’s believed to be a woman in China. But a renter to make Trump Birth Home great again is good news. Neighbors complained recently that the house had become something of an eyesore on the block, with overgrown grass that harbored “various pests and neighborhood cats.” As a local resident complained to DNAinfo in June, “This is what $2 million gets you — an abandoned house and a foreign investor in your neighborhood.” Weird, sounds familiar.